To test the hypothesis that schizophrenia might be associated with alterations of the endogenous cannabinoid system in human blood. Blood from 20 healthy volunteers and 12 patients with schizophrenia, 5 of which both before and after a successful antipsychotic treatment, was analysed for: 1) the amounts of the endocannabinoid anandamide; 2) the levels of cannabinoid CB1 and CB2 receptor mRNAs, and 3) the levels of the mRNA encoding the enzyme fatty acid amide hydrolase (FAAH), responsible for anandamide degradation. The amounts of anandamide were significantly higher in the blood of patients with acute schizophrenia than in healthy volunteers (7.79 ± 0.50 vs. 2.58 ± 0.28 pmol/ml). Clinical remission was accompanied by a significant decrease of the levels of anandamide (3.88 ± 0.72 pmol/ml) and of the mRNA transcripts for CB2 receptors and FAAH. These findings indicate that endocannabinoid signalling might be altered during the acute phase of schizophrenia not only in the central nervous system but also in the blood. These changes might be related to the several immunological alterations described in schizophrenia. Subjects with acute cannabis intoxication often display a schizophrenia-like syndrome, with hallucinations, altered judgement, false beliefs, and cognitive impairment . In other, predisposed individuals, cannabis can precipitate a psychotic illness , although this does not necessarily indicate a causative role of ECs in mental disorders. Finally, lack of motivation, apathy and avolition are almost invariably observed in long-term cannabis users, so as to mimic the picture of chronic or residual schizophrenia. Under physiological conditions, the EC system participates in the regulations of important functions, such as rest, cognition, movement, memory, and perceptions . Many of these functions are actually altered in the course of schizophrenia. There appears to be a substantial overlap between the areas commonly believed to be involved in the pathogenesis of schizophrenia  and those expressing the highest concentrations of EC receptors in the CNS , i.e. the limbic system (hippocampus/amygdala), nigro-striatal areas, and the prefrontal cortex, among the others. There has been evidence in the recent literature [7–9] that patients suffering from schizophrenia have detectable differences in their EC signalling when compared to normal controls. Leweke et al. reported elevated levels of the endogenous cannabinoid receptor ligand anandamide  in the Cerebro-Spinal Fluid (CSF) of patients with schizophrenia. Voruganti et al. have shown a correlation between the severity of psychotic symptoms and an increase in cannabis-induced striatal dopaminergic neurotransmission in a patient with the disorder. Finally, polymorphism of the gene encoding the CB1 receptor, which is the cannabinoid receptor subtype mostly expressed in the brain, has been associated with increased susceptibility to hebephrenic schizophrenia , thus suggesting that a malfunctioning EC system could play a role in the etiopathogenesis of this disorder. There have been several reports that schizophrenia is accompanied by overt alterations in the immune response, as well as by changes in the function of immune blood cells, and that many of these alterations can be normalized by anti-psychotic drugs [[12–14] and  for review]. In particular, a significantly increased number of activated macrophages and lymphocytes has been detected in the CSF of schizophrenic patients during acute psychotic episodes [16, 17]. Since activated macrophages and lymphocytes release significant amounts of ECs [18–20], it is possible that these blood cells contribute to some extent to the previously observed elevated levels of anandamide in the CSF of patients with a diagnosis of schizophrenia . It is worthwhile noting that some of the immune functions previously found to be altered during acute schizophrenia, such as interleukin and tumor necrosis factor-α release, are also known to be influenced by ECs acting at both CB1 and, particularly, CB2 cannabinoid receptors in macrophages, lymphocytes and dendritic cells . Notwithstanding the above observations, and despite the fact that ECs can easily cross the blood brain barrier , the levels of these compounds in the blood of schizophrenic patients have never been assessed. We analysed the peripheral blood of patients and normal controls, in order to detect any differences in the levels of: (i) the endogenous ligands of cannabinoid receptors (the endocannabinoids, ); (ii) the cannabinoid CB1 and CB2 receptors, and (iii) the fatty acid amide hydrolase (FAAH), one of the enzymes mostly involved in endocannabinoid inactivation . We report that anandamide plasma levels are elevated in untreated patients with schizophrenia, and that the amounts of this compound as well as of CB2 receptors and FAAH are decreased after a successful pharmacological treatment. Table 1 displays the data related to the BPRS total score for all the patients included in the study. In addition, the patients in subgroup 1 have been rated as ranging from moderately ill to severely ill (CGI score from 4 to 6). All patients who were reassessed showed a statistically significant difference between the pre- and post-treatment scores at the BPRS and CGI, which dropped by more than 50% in all 5 cases considered (Table 1). Patients 3, 5 and 8 in subgroup 2 scored 1 (much improved), whereas patients 6 and 7 in the same subgroup were evaluated as moderately improved (CGI score = 2). BPRS and CGI scores and anandamide blood levels of the twelve patients with schizophrenia included in this study. Five of these patients were assessed before and after remission of the symptoms (indicated by the significant decrease in the global BPRS and CGI scores) induced by treatment with olanzapine. CGI score ranged from 6 (severely affected) to 1 (much improved), and are shown in parentheses. 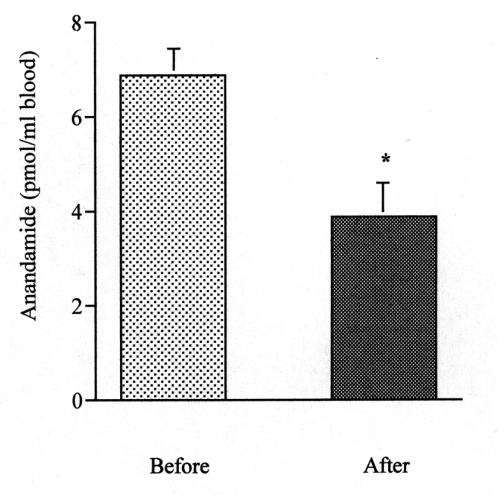 The amount of anandamide in healthy volunteers (control) was 2.58 ± 0.28 pmol/ml (mean ± SEM, n = 20). Means were compared to the control by the unpaired Student's t test, threshold of significance was 0.95. Table 1 also shows the blood levels of anandamide in each of the twelve patients affected by schizophrenia. The mean ± SEM amounts of anandamide levels in the control volunteers and the patients with acute schizophrenia are also shown in Table 1 and in its legend. A statistically significant difference between the two groups was found, whereas the mean values for the patients in remission were not significantly different from those of the control subjects. Clinical improvement, with the reduction in the BPRS and CGI scores, was paralleled by the decrease in both the levels of peripheral ANA (assessed in those 5 patients sampled before and after pharmacological treatment, Table 1, Fig. 1) and of the intensity of the bands for the mRNA transcripts of FAAH and CB2 (assessed in those 5 patients sampled before and after pharmacological treatment, Fig. 2). We did not observe any consistent difference for the CB1 mRNA transcript, which appeared to be less expressed than that of CB2 in all the blood samples analysed (Fig. 2b). Amounts of anandamide (pmol/ml) in the blood of the 5 patients with schizophrenia before and after pharmacological treatment. *, P < 0.02 by the paired Student's t test. Expression levels of CB1, CB2 and FAAH mRNAs in patients in acute phase of schizophrenic illness and following pharmacologically-induced remission of the symptoms. The expression levels were evaluated by RT-PCR as described in the methods. Lanes 1, 3, 5, 7, 9: patients n° 3, 6, 8, 5 and 7 (see Table 1), in acute phase; lanes 2, 4, 6, 8 and 10: patients n° 3, 6, 8, 5 and 7, in remission. Panel A, B, C and D are relative to PCR analysis for β2-microglobulin (house-keeping), CB1, CB2 and FAAH, respectively. The bands shown in the figure are from 20 (Panel A), 35 (Panel B), 30 (Panel C) and 30 (Panel D) PCR amplification cycles. Despite several suggestions that the EC system may play a role in the pathogenesis of schizophrenia [7, 9, 22], and the finding of elevated levels of anandamide in the CSF of patients suffering from schizophrenia , no study has addressed so far the question of whether the EC system is also altered in the serum and mononucleated cells from the blood of patients with this mental disorder. This issue is important in view of the several immunological correlates of schizophrenia, which include, among others, a shift from a Th-1-type to a Th-2-type immune response, a significant increase of activity of blood monocytes/macrophages, and a corresponding up-regulation of cytokine release . Indeed, the ECs have a well-established immune-modulatory effect [23, 24, 20]. Thus, possible changes in the blood levels of these endogenous mediators could explain in part, or be a consequence of, the modified immune response observed in the course of schizophrenia. Furthermore, since the strong impact of acute schizophrenia on some immune functions can be attenuated by treatment with anti-psychotic drugs [15, 25], the effect of antipsychotic medications on the possible modifications of the EC system in the blood of these patients also needs to be assessed. Our study suggests the existence of a significant alteration in the peripheral blood levels of schizophrenic patients of both the endocannabinoid anandamide and the mRNA for the anandamide degrading enzyme, FAAH. Furthermore, we found that the elevation of anandamide levels in our sample is confined to the acute phases of disease, to then normalize after a successful pharmacological treatment. Eventually, there were no statistically significant differences in anandamide levels between treated patients and controls. However, no direct correlation between anandamide blood levels and the BPRS or CGI scores of each patient, be it before or after remission, was found. Our results suggest that an acute psychotic episode might be characterised, among other factors, by an elevation in the peripheral concentration of anandamide, thus possibly inducing a compensatory increased expression of the degrading enzyme, FAAH, in an attempt to normalise their circulating levels. It is of interest that our patients consistently showed the same pattern, with their level of circulating anandamide forming two well-identifiable and distinct clusters at around 8 and 3 pmol/ml for group 1 and 2, respectively. Anti-psychotic medications seem to have played a crucial role in these patients by thwarting clinical symptoms on the one hand, and, in parallel, by reducing the levels of endocannabinoids and FAAH mRNA on the other hand. We did not identify any patients failing to respond to their pharmacological treatment, although it would have been interesting to measure the concentration of anandamide in the absence of an improved clinical presentation. This event would have carried important information as to whether decreased EC concentration was related to clinical amelioration or rather to pharmacological treatment per se, regardless of clinical outcome. The peripheral elevation of anandamide levels might be related to the hypothesized anomaly of this signalling system in the brain of patients with schizophrenia, since these compounds can easily cross the blood brain barrier . However, it is unlikely that changes in the peripheral amounts of ECs found in the blood can reflect to a great extent alterations occurring at the CNS level, in schizophrenia as well as other neurological and psychiatric disorders, since these compounds: (i) due to their lipophilicity act as autocrine/paracrine mediators, and no blood EC carrier protein has been identified to date; and (ii) are also produced by blood cells. More probably, the changes in anandamide blood levels found here might be a consequence, or alternatively one of the causative factors, of the previously observed immunological abnormalities in patients with schizophrenia . For example, in view of the negative effect of leptin on endocannabinoid biosynthesis , and of the reduced levels of this hormone during acute schizophrenia , it is possible that reduced leptin causes the increased levels of blood anandamide observed in the schizophrenic patients investigated in the present study. This hypothetical mechanism would explain also why olanzapine was found here to lower EC levels back to those observed in healthy volunteers, since treatment of schizophrenia with this antipsychotic drug was shown previously to restore normal serum leptin levels . Alternatively, since antipsychotics are also known to reduce the number and/or activity of leukocytes , it is possible that the reduced levels of anandamide following olanzapine treatment are a mere consequence of the reduced activity of lymphocytes and monocytes, which are normally capable of producing anandamide only after activation [19, 20, 29]. Regarding the reduction, also observed here, of cannabinoid CB2 receptor mRNA following treatment with olanzapine, again this could be a consequence of reduced activity of blood leukocytes, since also CB2 expression has been previously shown to be subject to regulation in activated macrophages and leukocytes . Interestingly, also the function of G-proteins in the blood has been recently shown to be down-regulated after treatment with neuroleptic drugs [30, 31], and since CB2 is a G-protein-coupled receptor [1, 10], it is likely that the reduction of the expression of this receptor detected after treatment with olanzapine and subsequent recovery from the symptoms of schizophrenia is also accompanied by a corresponding decrease of CB2 receptor functionality. Clearly, blood endocannabinoids cannot be regarded yet as possible markers of acute psychotic disorders, and even less as predictors of the patients' response to antipsychotic medication. Furthermore, we did not test the specificity of ECs alterations to schizophrenia, and it may be that other major psychoses exhibit similar biochemical aberrations, and perhaps similar stage-related fluctuations. Therefore, our data warrant further investigations with the aim of better understanding the pathological relevance of this as well as of other correlative studies. It lends further support to the hypothesis of an involvement of the EC system in schizophrenia, clearly demonstrating an anomaly in three separate components of this system, anomaly that, at least in our sample, appears to be associated with an acute phase of the illness. However, the small size of our sample warrants for great caution when interpreting these results. It suggests that at least part of the immunological abnormalities observed during acute schizophrenia might correlate with changes in the "output" of the EC system in the blood. A case-control study design was used. Subjects were selected from patients treated in the clinical facilities of the Department of Mental Health in Pomigliano, Naples, Italy, from January to December 2001. Patients were selected only if showing, or described in the medical records as affected by, symptoms of schizophrenia, and if wishing to take part in the study. After this first step, the recruited subjects received a diagnostic assessment, and only those meeting the DSM-IV criteria for schizophrenia  entered the study. Other necessary criteria for inclusion were: absence of previous or present neurological disorders, no abuse of cannabis in the year preceding the study, and absence of a significant learning disability (IQ<85). All the patients included had to be in a quite controlled setting (namely, their family environment), where no abuse of cannabis and compliance to treatment could be assessed with a high degree of certainty. These strict criteria carried inevitable reflections on the number of patients included in the study. The individuals in our research (n = 12) were split in two subgroups. In subgroup 1 were those in an acute phase of their schizophrenic illness, who had not received pharmacological treatment for at least 30 days prior to evaluation, 9 males and 3 females, with a mean age of 32.9 ± 7.0 years (range, 18–45 years), of Caucasian race (n = 12). All individuals received the Diagnostic Interview for Genetic Studies (DIGS; ), a semi-structured DSM IV interview. All patients were rated also by means of the Clinical Global Impression scale (CGI; ), and the treatment outcome was evaluated with the CGI-Improvement (CGI-I). We used the Brief Psychiatric Rating Scale (BPRS; 18-item version; ) to characterize the severity of the symptoms of the illness, where 1 indicates absent and 7 severe. The second subgroup (n = 5) consisted of patients previously assigned to subgroup 1, who had achieved clinical remission since at a least one month, following a successful pharmacological treatment with olanzapine (patients 3 and 5 were on 20 mg/day, whereas subjects 6, 7 and 8 received 25 mg/day). The re-test procedure for the 5 probands was performed 92 ± 11 days after the assessment in the acute phase of the illness. Clinical remission was defined a priori as at least 50% reduction on the BPRS score and a clinical evaluation of 1 (much improved) or 2 (moderately improved) at the CGI-I score. In particular, patient Nr. 3 was investigated during the third episode of her disease. She had been treated with risperidone at the onset. We switched to olanzapine because of hyperprolactinemia. Her response to treatment was satisfactory with both medications, and she always achieved a nearly complete remission. Relapses were apparently caused by an excessive reduction or a spontaneous discontinuation of her medication regime. Patient Nr. 5 was suffering from the second episode of schizophrenia. We treated her with risperidone (first episode) and then olanzapine for the episode described here. The relapse was caused by her arbitrarily stopping her medication. Patient Nr. 6 was at his first episode of schizophrenia, which however had lasted for a prolonged time because it went untreated (more than a year). In fact, his family postponed his referral to mental health facilities because of fear of stigmatization. We started him on olanzapine 20 mg/day, but he needed 25 mg to show a satisfactory response (CGI from 6 to 2). Patient Nr. 7 was experiencing several positive symptoms since two years, with serious consequences such as loss of his job. His schizophrenia did not respond to two classical antipsychotics administered by a previous psychiatrist. The initial 20 mg of olanzapine had to be titrated up to 25 to obtain the optimal response. Finally, patient Nr. 8 was treated with olanzapine since he was included in the study. He had previously not agreed to be treated, and had been suffering from several positive symptoms for approximately seven years. He only had occasional administrations of haloperidol, which was added to his food by the patient's wife without him being aware of that. In retrospect, there appeared to be no response because of these treatment inconsistencies. Twenty normal controls were recruited from the medical and nursing staff at the Department of Mental Health in Pomigliano. They were in the same age range as the study patients, and were likewise comparable for level of education and gender representation. A normal IQ, absence of previous and present neurological disorders, and having not abused marijuana/exogenous cannabinoids were used as inclusion criteria for controls. The control subjects had no first-degree relative suffering from a major psychiatric disorder. All subjects gave 10 ml blood for the laboratory testing. All blood samples were taken in the morning, from non-fasting subjects, and there were no feeding-related variables that could account for any possible difference in ECs levels between groups. Peripheral blood samples (10 ml) were collected by vein suction in EDTA (25 mM final concentration) and processed no later than 3 hours after blood was drawn. For the LC-MS determinations, EDTA and phenyl-methyl-sulfonyl-fluoride (PMSF) (100 μM final concentration) were added to blood samples. PMSF is an inhibitor of fatty acid amide hydrolase (FAAH), and was added in order to prevent endocannabinoid degradation. Five ml of whole blood for each sample was carefully layered over 5 ml of HISTOPAQUE® 1077 solution (SIGMA) in ACCUSPIN® tubes (SIGMA) and centrifuged at 400 × g for 30 min at room temperature. After centrifugation, erythrocytes and granulocytes sedimented at the bottom of the tube. After removal of the clear plasma layer from the top of the tube, the opaque layer (about 2 ml) containing the mononuclear cells was collected, resuspended by gentle aspiration in 10 ml of phosphate buffered saline (PBS) and centrifuged at 250 × g for 10 min at room temperature. The cell pellet was resuspended, washed twice in 5 ml of PBS and stored at -80°C for RNA extraction. For quantitative determinations, the plasma and the mononucleate cell layers were collected together, the proteins precipitated by adding 3 vol. of acetone, the supernatants were collected and subjected to lipid extraction with methanol/chloroform. Enough of each solvent was added to reach a final ratio buffer/methanol/chloroform of 1:1:2 (v/v/v). Methanol containing 5 pmol of d8-anandamide was added as internal standard. The organic phase was then dried under nitrogen and purified by means of open bed chromatography on silica gel [36, 37]. The lipid extracts were analyzed by liquid chromatography-atmospheric pressure chemical ionization-mass spectrometry (LC-APCI-MS) by using a Shimadzu HPLC apparatus (LC-10ADVP) coupled to a Shimadzu (LCMS-2010) quadrupole MS via a Shimadzu APCI interface. MS analyses were carried out either in the selected ion monitoring (SIM) mode as described previously . The temperature of the APCI source was 400°C, the HPLC column was a Phenomenex (5 μm, 150 × 4.5 mm) reverse phase column, eluted as described . Anandamide (retention time 14.5 min) was quantified by isotope dilution with the above-mentioned deuterated standards (same retention time and m/z = 356.3) and its amounts in pmoles normalized per ml of processed blood. Intra-assay variation using this method was 2.5 ± 0.3%, whereas inter-assay variation was 10.1 ± 2.5% (means ± SEM, n = 4). Total RNA was extracted from mononuclear cells by Trizol® reagent (Life Technologies) according to the manufacturer's intructions. To remove contaminant DNA, 4 μg of RNA samples were DNAse-digested utilizing the DNA-free® (Ambion) protocol. 2 μg of total RNA were reverse transcribed in a 20 μl reaction mixture containing: 75 mM KCl, 3 mM MgCl2, 10 mM dithiothreitol, 1 mM dNTPs, 50 mM Tris-HCl pH 8.3, 20 units of RNAse inhibitor (Roche), 0.125 A260 units of hexanucleotide mixture (Roche) for random-priming and 200 units of reverse transcriptase (Superscript®, GIBCO). The reaction mixture was incubated at room temperature for 10 minutes and at 42°C for 90 min, then the reaction was stopped by heating at 95°C for 5 min, cooled on ice, and stored to -20°C. Control samples (no-RT) were prepared by omitting reverse transcriptase in the retrotrascription mixture. DNA amplification was performed in a 50 μl PCR reaction mixture containing: 0.5–2 μl of the retro-trascription mixture, 1X PCR buffer (supplied as component of the DNA polymerase kit), 2 mM MgCl2, 250 μM dNTPs, 0.5 μM each of 5' and 3' primers and 2.5 units of Platinum®Taq DNA polymerase (Life Technologies). The mixtures were amplified in a PE Gene Amp PCR System 2400 thermocycler (Perkin Elmer). The primers used were: CB1 sense primer, 5'-CAG AAG AGC ATC ATC CAC ACG TCT G-3'; CB1 antisense primer 5'-ATG CTG TTA TCC AGA GGC TGC GCA GTG C-3'; CB2 sense primer 5'-TTT CCC ACT GAT CCC CAA TG-3'; CB2 antisense primer 5'-AGT TGA TGA GGC ACA GCA TG-3'; FAAH sense primer 5'-GCC TGG GAA GTG AAC AAA GGG ACC-3'; FAAH antisense primer 5'-CCA CTA CGC TGT CGC ACT CCG CCG-3'; β2-microglobulin sense primer 5'-CCA GCA GAG AAT GGA AAG TC-3'; β2-microglobulin antisense primer 5'-GAT GCT GCT TAC ATG TCT CG-3'.). The amplification profile consisted of an initial denaturation of 2 min at 95°C and 20–35 cycles of 30 sec at 95°C, annealing for 30 sec at 55°C (β2-microglobulin) or at 60°C (CB1, CB2 and FAAH) and elongation for 1 min at 72°C. A final extension of 10 min was carried out at 72°C. The expected sizes of the amplicons were 338 bp for CB1; 329 bp for CB2; 202 for FAAH and 269 bp for β2-microglobulin. The β2-microglobulin house-keeping gene expression was used to evaluate variations in the quality and content of the mRNA and to monitor cDNA synthesis in the different preparations. Furthermore the PCR primers for β2-microglobulin and FAAH were selected on the basis of the sequence of the β2-microglobulin gene (NCBI accession number M17987) by including the intron 402–1017, and of the sequence of the FAAH human gene (NCBI accession number AF098012) by including the intron 497–722. In the presence of contaminant genomic DNA, the expected size of the amplicon would be 426 and 885 bp for FAAH and β2-microglobulin, respectively. 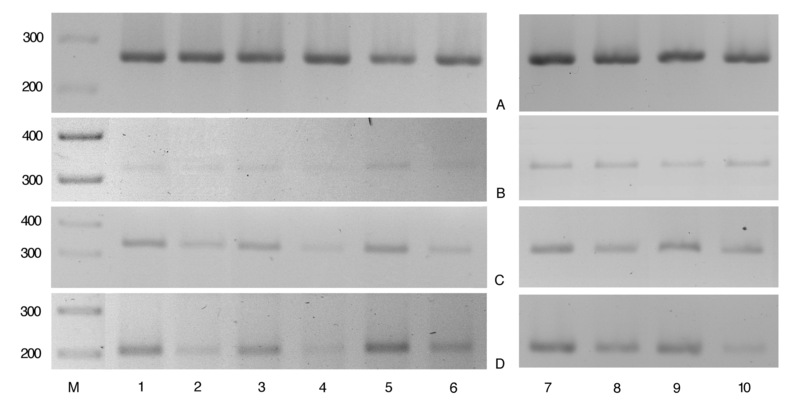 10–20 μl of PCR products were electrophoresed on 2% agarose gel (MS agarose, Roche) in TAE buffer at 4 V/cm for 4 h. Ethidium bromide (0.1 μg/ml) was included both in the gel and electrophoresis buffer and PCR products were detected by UV visualization and recorded by photo (Polapan 55, Polaroid). Evaluation of the relative expression levels was performed by analysing the amount of amplicon synthesized at different numbers of amplification cycles for a fixed quantity of cDNA in the assay. In order to obtain a quantitative evaluation of the relative amounts of the mRNA transcripts, the different PCR reactions were performed with a different number of cycles. Differences in band intensities obtained using a non-saturating number of cycles, in relation to the intensity of the housekeeping mRNA transcript (i.e. β2-microglobulin, which works as an "internal standard"), are highly indicative of differences in the levels of expression of the corresponding genes. Results of the anandamide level measurements, expressed in pmol/ml of blood and as means ± SEM, were compared by the unpaired Student's t test. When data from patients before and after pharmacological treatment were compared, the paired Student's t test was used. Nicola De Marchi, Luciano De Petrocellis contributed equally to this work. We thank Dr Alfredo Dama, MD, for useful advice and support, S. Guardascione and G. Capuano for assistance, and S. Piantedosi for the artwork. This study was supported by grant POP 98/5.4.2 from Regione Campania to LDP. NDM, a senior psychiatrist, conceived this study, selected the patients and performed all clinical ratings, and was assisted by FD; VDM and LDP conceived and coordinated the study and took part in all biological assays; PO performed all molecular biology experiments; FF extracted the lipids from blood sample and measured the levels of anandamide by LC-MS. All authors have read and approved the manuscript.